As published by Vanguard News, the crisis blew open after Odubu’s coordinator, Barr.Humphrey Uanseoje, signed a letter with other governorship aspirants of the party such as Ogienwonyi, Imasuagbon and Barr. Omo Irabor, which they sent to the national leadership of the APC where they alleged plans by the state Chairman of the party, Anslem Ojezua, to doctor the delegates list for the gubernatorial primary with the backing of Oshiomhole. The publication shocked many watchers of the politics of the state since it would be the first time the deputy governor will be openly accusing his boss of alleged plot to manipulate the forthcoming primary of the APC. Odubu’s loyalists and those of the governor had been in the trenches following Oshiomhole’s apparent reluctance to back his deputy whom many perceived has been very loyal to his boss since they came into office. But worried by this development, Ogie, who is known as one of the generals in the Oshiomhole’s political family, took up the initiative to settle the rift between the governor and his deputy. Ogie, in collaboration with the member representing Etsako Federal Constituency in the House of Representatives, Philip Shuaibu, decided to make this move, given that Odubu has been part of Oshiomhole’s political machinery since 2007. The intention was to stop the animosity which they believed will help to keep the governor’s camp intact, ahead of the primary of the party. What Ogie did was to put persons also close to Odubu in the reconciliation committee so that the deputy governor will not lose confidence in the committee. As a result, a former Edo State Commissioner for Local Government and Chieftaincy Matters, Chief Lucky James, and Chief Gabriel Oibo, who are key supporters of Odubu, were drafted into the committee. This committee held their first meeting on Sunday, April 10, 2016, where they agreed to meet with Odubu first to preach the gospel of peace to him. When the committee met with Odubu, Ogie informed him of the need to restore peace between him and the governor, saying their visit was on a friendly note and had nothing to do with politics. Odubu was said to have expressed his grievances and informed them that he had nothing against the governor but that he was disappointed that some of his followers were being victimized due to their support for his governorship ambition. However, Odubu informed members of the committee that he was ready to hold the peace meeting with the governor whom he said he had enjoyed close relationship with until recently. On Monday April 11, 2016, Oshiomhole came back to Benin from his village, Iyamho, where he met the peace committee waiting for him. Apart from the members of the committee, led by Ogie, the state Chairman of the APC, Anslem Ojezue; state Secretary, Chief Osaro Idah; Oshiomhole’s in-law, Victor Eboigbe and Chief of Staff to the Governor, Patrick Obahiagbon, were also at the meeting. Ogie, who opened the meeting, narrated how the group, including the deputy governor, had worked closely in the past ten years with Oshiomhole, saying it would be bad to allow bickering between the governor and his deputy to continue. The Commissioner for Works offered the two leaders the opportunity to sort out their problem behind closed door while they excused them to do so. Philip, Oibo and James concurred with Ogie, stressing the need for the governor’s political family to be united in the run up to the party primary and the governorship election. Oshiomhole, Sunday Vanguard learnt, appreciated their concern but informed the meeting that he will prefer they were around so they could know the real issues and treat them. His deputy concurred and everybody stayed for the meeting. Firing the first salvo, Odubu lamented that his office had been starved of funds, his political allies victimized, the governor refused to attend his wife’s birthday and, above all, the governor directed his Attorney General, Mr Henry Idahagbon, and Washington Osifo to write a petition against him to the Economic and Financial Crimes Commission (EFCC) with a view to impeaching him. The deputy governor further lamented how the governor had allegedly relegated him to the background, expressing shock that the cordial relationship, which had existed between him and the governor, broke down. 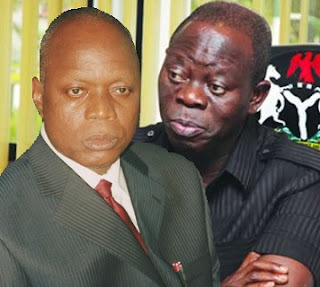 But responding, Oshiomhole, who recalled how he had backed his deputy in his political battles and his several advice to him as a brother, explained that the parlous state of finance of Edo had even affected his own office and other government offices, and not only that of the deputy. He narrated how he had been travelling without his aides due to paucity of funds. Oshiomhole went further to berate his deputy for being part of those who signed a statement accusing him of backing the state Chairman of the APC, in the alleged plot to manipulate the delegates list ahead of the primary of the party, asserting that the deputy’s action was a clear indication of an attack against his person. But Odubu, who defended himself, denied being behind the statement, explaining that his coordinator put his signature with some other party members who needed it but never knew what they wanted to use it for. But the leaders of the party expressed their doubt in his defence, saying he should have debunked the publication if he was not behind it. Odubu, however, apologised to Oshiomhole, assuring that such mistake will not be repeated. Tension in the room heightened when Oshiomhole started responding to the allegations against him by Odubu that he did not attend his wife’s birthday and that the governor had treated him recently like a leper. Sunday Vanguard gathered that the governor declared to the leaders that he had deliberately avoided attending events at his deputy’s house after it was revealed to him that his deputy allegedly contracted native doctors to hurt him so that Odubu will take over as governor. Oshiomhole said he was informed of the alleged plan by a leader of the party and that he had met with the native doctors whom his deputy allegedly contracted to do the damage, adding that the native doctors admitted and gave him details of how the rituals were executed. Oshiomhole added that the party leader who leaked the information, who was out of the country, was ready to confront the deputy with the details of his alleged meeting with the witch doctors. He further stated that he could not have attended any ceremony at Odubu’s place, saying he would not want to be poisoned. The governor’s disclosure was said to have come as a surprise to the APC leaders but it equally elicited strong rebuttal from his deputy who attributed what he described as the spurious allegation to the handiwork of his political enemies. To buttress his innocence, Odubu volunteered to contact a strong traditional doctor in Benin, so that those who accused him will come and take an oath before the gods. He vehemently denied the allegation and reiterated his loyalty to the governor. But some of the party leaders at the meeting were said to have countered Odubu with his suggestion, informing him that he should have suggested swearing with the Bible since he is a Catholic. But Odubu thundered that he was shocked with the allegation and would like to clear his name with whatever that will convince everyone. Some of the party leaders at the meeting admonished Odubu to end his governorship ambition. However Ogie calmed the situation and the parley ended on a good note after both parties expressed satisfaction. As the governorship primary of the party, scheduled to hold sometime in June-July, draws closer Oshiomhole’s foot soldiers, led by Ogie, are working round the clock to ensure a united house. Odubu is viewed as one of the most formidable aspirants in the APC and cannot be taken for granted. Sunday Vanguard was informed that the governor and his deputy exchanged banters after the meeting and a date for another peace meeting was fixed for this week.